And so we wrap up our look at the scenarios from Panzer Grenadier: Road to Dunkirk. With the fourth edition games, we’ve taken a different approach than those we did years ago, and certainly different than that of other publishers. We want the games to tell a story, to work as a history of the campaign as well as a game based on it. Philippe Léonard does his homework – Road to Dunkirk is deeply researched in both primary and secondary sources, in multiple languages. It’s not a major selling point to most wargamers – who’ll laud “fine simulations” that cop their insights from a video game – or maybe even to more than a handful, but it matters a great deal to me. 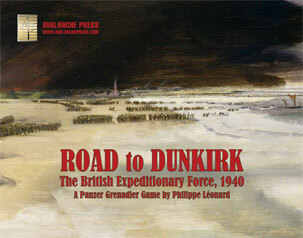 So I’m really pleased to add a product of Road to Dunkirk’s quality to our line. You can see Chapter One here, Chapter Two here, Chapter Three here, Chapter Four here, the first half of Chapter Five here, second first half of Chapter Five here and the first half of Chapter Six here. Third Armoured Brigade and C Brigade of the Beauman Division, a hastily-organized collection of reservists from the Pioneer Corps, held a thin line along the marshy Andelle River. On the evening of 7 June, R Battalion found a French cavalry regiment south of Forges-les-eaux but it withdrew early in the morning; the arrival of some tanks compensated for this defection. The next morning began as a fine and quiet day. At 1000, as German motorcyclists neared the main bridge it exploded. Later German tanks attacked the left flank covering the level crossing but they pulled back when the British cruiser tanks opened fire. The British claim that not long afterwards two columns of French tanks approached the right flank where their arrival had been expected. As soon as they were through, they traversed their guns and opened fire on the defenders from the rear, while the main German forces pressed in from the front over a wide area. After action reports stated that the tanks were French, but it seems that these were German tanks having found a ford in the river some 400 meters downstream. By afternoon the line of the Andelle was fatally ruptured and 7th Panzer Division poured through the gap. The outflanked R Battalion fell back to Rouen. Once again, the Brits are holding a river line against the rampaging panzers. The scratch units are surprisingly eager for battle, and they have armor support, but German mobility is a powerful edge. And we once again have a great scenario title. After the failure of the Somme attacks on 27 May, the 3rd Armoured Brigade had been bled white and went back to Rouen to refit. The 9th Royal Lancers, brought up to strength by a composite squadron of Bays and 10th Hussars, had been supporting 51st Highland Division both in its defensive battle on 5-6 June and in rounding up infiltrators on the south bank of the Bresle River. Early on 8 June, the regiment set out to join the rest of the division east of Rouen but it was eventually deployed on the railway lines facing east. Meanwhile, 5th Panzer Division pushed towards Rouen. Behind the Rouen railroad line, the British tanks fought a sharp little action in which their 2-pounders showed themselves quite able to deal with Panzer IIIs when facing equal numbers. German strength was still overwhelming and the regiment was lucky to escape and cross the Seine River to temporary safety. It’s a tank battle! A good-sized one, with a mixed lot of British tanks including the plodding but thick-skinned Matilda and the ridiculous little Mark VIb. The Germans have their own crapulent light tanks motoring around alongside the real tanks. Break out the Wreck markers, you’re going to need them. At nightfall on the previous day, Gen. Erwin Rommel ordered his 7th Panzer Division to reach and cross the river Seine in a swift move. The Elbeuf and Oissel bridges would be the targets of 25th Panzer Regiment and 7th Motorcycle Battalion. Meanwhile French cavalry had received the mission to block any access to the Seine and the Pont-de-l’Arche bridge. Slightly to the east, British infantry were to hold the far bank of the river and cover the railway bridge at Le Manoir. As the 7th Panzer Division drove towards the southwest it met Capitaine Huet’s Groupe Franc. Supported by artillery and mortars, the German infantry pushed it back quickly and pressed on towards the main defense line along the River Seine. At about 0400 three German tanks and some lorried infantry motored confidently forward. The French knocked out one tank whereupon the Germans deployed and began a desultory fire-fight with the Yorkshiremen. The combat lasted until 0700 when Huet ordered the Pont-de-l’Arche bridge destroyed; the bridge at Le Manoir lasted only five minutes more. This left four British companies, the engineers and several French AFVs on the wrong side of the river. The German positions on the high ground began to tell as the Allies made their way through the village streets in a wild sauve qui peut. They had to swim the wide Seine to escape, with some men fetching boats for the non-swimmers. The defenders have numbers – a serious edge in numbers – but they have a lot of ground to cover and the Germans are in far better shape as they can concentrate on a single objective at a time. Adding to their woes, the Allies suffer from mixed command with about a third of their numbers and all of their heavy weapons and armored vehicles coming in horizon bleu. Dawn came with German armor entering Rouen. Consequently, the French IX Corps together with the 51st Highland Division changed the direction of their withdrawal from Rouen to Le Havre. In eastern Normandy, French cavalry units and Scotsmen from the 51st Highland Division united to attempt a fighting withdrawal to impede the way of the Germans towards the Seine River. The enemy was often closer than expected and meeting engagements became common. The Scots were defending Beaumont, a typical Normand hamlet surrounded by fields and woods. At noon, a German convoy of about 30 vehicles advanced on the village, stopped and let the infantry encircle the position through the woods. The Scots counterattacked and pushed back the Germans. When some armored vehicles eventually arrived to reinforce the assault, the Scots had to give up and surrender. Fort Apache: Normandy. The Scots are surrounded, but, well, they’re Scots and they’re not giving up easily. That “armored support” adds up to a platoon of Panzer I “tanks,” no more effective than the Bren carriers the Scots can use in a support role. The Germans are going to have to come in and get the Scots man-to-man. The Norman seaside town of St-Valéry-en-Caux had been selected for the embarkation of the encircled British forces. Amidst chaos, congestion and panic, a hardly secure perimeter was hastily flung around the town to protect the beaches and the cliffs from where the enemy guns could prevent rescue. On the eastern part of the perimeter, the Germans chose quite a leisurely advance, waiting until mid-afternoon to assault the weak British lines. Few German officers were willing to expose themselves or their men with the war nearly over. The 1st Black Watch manned the defense of St-Pierre le Viger with just two companies and one carrier section. Colonel Honeyman had moved the remainder to Houdetot, one mile to the east. The French cavalry supporting the British troops refused to withdraw and insisted on holding until dark. Orders to withdraw for embarkation never arrived and, at daybreak on 12 June, the Scots were still holding out, unaware that all flanking troops had left. Despite the sacrifices, the end had arrived. The Germans are surging forward with high morale, numbers, tanks and artillery. The Scots have their Scottishness, and it might be enough in this pretty intense fight (lots of troops, not lots of terrain). Plus there’s French cavalry on horseback. Near Rouen, another British battalion had been put together from the Infantry Reinforcement Depot and its command given to Lt. Col. Alexander Syme of the Royal Scots. Col. Archibald Beauman, commanding the ad hoc division that bore his name, ordered Symes to block the Amiens-Rouen road at Isneauville and supported him with four 25mm anti-tank guns and a platoon of machine guns. The village was a well-chosen position since east of the road the ground falls steeply into a heavily wooded valley restricting vehicle movement to a narrow corridor. Artillery fire started to fall on the British at 1600 and almost immediately tanks and motorcyclists approached down the long straight road at high speed. One of the company commanders, helped by his orderly, dragged coils of wire across the road and threw in some anti-tank mines. The leading tank ground to a halt in the wire and was damaged by a mine. This effectively blocked the road and the defenders set about beating off a series of frontal attacks, first by tanks and then by infantry supported with artillery. It was almost 1900 before the Germans began to work their way round the left flank, whereupon Syme, whose orders were not to allow himself to be encircled, pulled his forward companies back through his reserves and redeployed his anti-tank guns at the rear position. Obligingly the Germans repeated their bull-headed tactics and were again brought to a halt. By this time it was dusk, and the dispirited enemy pulled back to wait until morning. And we finish our story with a small scenario, with a pretty strong German tank-infantry force trying to eject Franco-British defenders from town positions and drive on past. Despite the strategic situation, the Allies are determined to hold, so the Germans are once again going to have to fight.